Not specifically a Romilly or Roxanne issue but I thought that the following was worth writing up. I have Riant moored on Lake Windermere, in the English Lake District, on a fixed marina berth. The marina is very sheltered but the water level in the lake changes, sometimes dramatically depending on differences in inflow and outflow. The biggest changes apparently occur in the winter months. 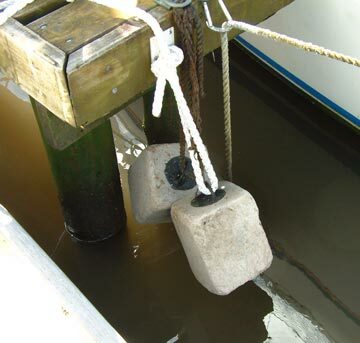 Neighbouring boats use a variety of methods to try to ensure that their mooring lines don’t become too tight or too loose. The favourite of these is to moor to a line attached to a weight with the line running through a carabiner. 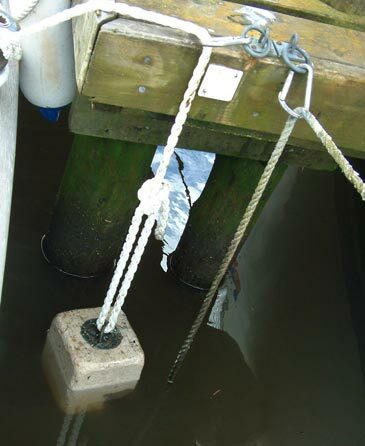 When I was last up at the boat I noticed that there was an unused mooring line at the end of the dock next to my boat. A friend and I gave this a good pull and up came two cast concrete blocks. This is far more weight than I needed to hold Riant secure so I decided to by some new mooring ropes and split the weights so I can use one at the bow and one on the starboard side of the boat. I tied the weights onto my new lines and then cut the old rope away. I now have one weight on a line passing through a carabiner. Pictured here before I dropped it in. Until I can get onto a floating dock this is, I think, the best I can do to keep the mooring lines secure and allow for changes in water level. I am slightly concerned that the weights will sink into the mud and thereby have a greater holding weight but I’ll try and visit regularly whether I have time to sail or not and give them a pull to keep them clear.